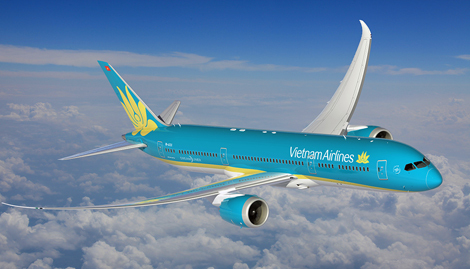 Since September 1, Vietnam Airlines’ London-Hanoi route is served by a brand-new B787-9, replacing an aged B777. There are three nonstop flights per week – on Sundays, Tuesdays and Fridays from London – all departing 1445 and arriving in Hanoi at 0750 the next day. The return from Hanoi leaves at 0130, landing at 0740, on Sundays, Tuesdays and Fridays. The B787-9 also started operating between London Heathrow and Ho Chi Minh on September 2. There are two nonstop flights from per week on this route – Wednesdays and Saturdays – both departing London at 1445 and arriving at 0825 the next day. The Dreamliner has been operating domestic services between Ho Chi Minh City and Hanoi since August. I was transferring in Hanoi after a 2020 flight from Danang (click here to read the review). After landing at 2125, I took the free shuttle bus from Hanoi’s domestic terminal to International Terminal 2. When I got there at 2200, I followed the signs to level three departures and went through fast-track security where my documents were checked (I had already checked in at Danang – my luggage through-checked to London and two boarding passes provided). Screening didn’t take more than a few minutes (laptops and liquids out) so I was soon having my passport stamped at immigration (there was a priority lane) and stepping airside to follow the signs to the Vietnam Airlines’ business class Lotus lounge (shared with all Skyteam carriers) two minutes away. Located up a set of escalators, the facility overlooks a car park, and a glass wall at one end faces the gates and duty-free area below. There was plenty of seating (it wasn’t busy) but the lighting was quite bright. Free wifi was available with a password, along with shower, and papers and magazines (mainly in Vietnamese). There were both departure screens and frequent loud announcements. The décor was beige and brown, with decorative wooden latticework and pot plants breaking up the space. A separate room had three electronic massage chairs, which were surprisingly good. There was a staffed bar serving free alcohol, as well as self-service fridges with soft drinks and beer. A central buffet had mini sandwiches, boiled eggs, instant noodle pho soup (just add water and microwave), sliced fruit, muffins, yoghurt and salad. Departure screens showed my 0130 flight as on “final check-in” until about 0100 when it changed to “boarding”. The lounge was empty by this point except for passengers on this flight and everyone left at the same time, walking the three minutes to Gate 24. Economy passengers were already in a long queue but we were able to use the Sky Priority fast-track lane, passing straight through on to the airbridge. Near the entrance to the plane a door was open and I could see torrential rain and lightning outside. 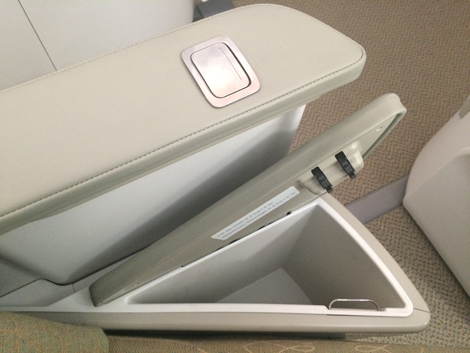 I took my seat (1K) at the front of the new B787-9, unpacking a few belongings, putting on a pair of socks from the amenity kit provided, and accepting a cold towel and a glass of champagne (three types of fruit juice were also available). Newspapers were offered later. 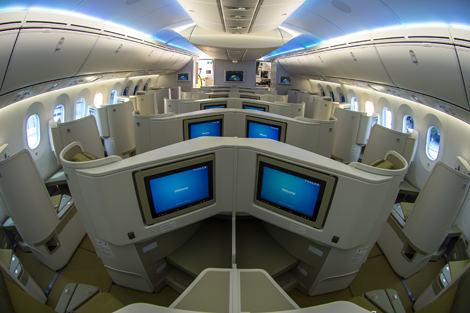 The business class cabin is configured 1-2-1 (A, D-G, K) in a herringbone layout across seven rows. Each seat is quite private, with outside ones angled away from the aisle in the direction of the window, and middle seats pointing inwards but divided from the one next to it by a section of wall. The seat converts to a fully flat bed, connecting with a padded ottoman in front (I noticed the front lip of this isn’t supported by the shelf underneath so flops down a bit when you rest your feet on it). The sturdy shell surround is cream and grey, with beige leather and fabric upholstery on the seat itself. There are quite a lot of features – a pop-up armrest by the aisle with a secret cupboard next to it, a remote and 15.4-inch HD touchscreen (if you press a button it pops out of the wall and angles towards you). There is a reading light, a cubby for two bottles of water and other bits and pieces, a USB port, and a universal power socket (although electricity wasn’t available for the first part of the flight). 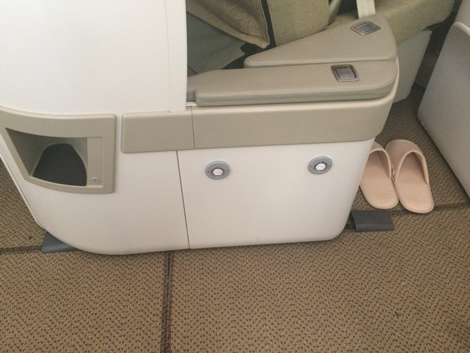 A space under the ottoman stores shoes, and steps built in to the side of seat bases help you reach into the overhead lockers. Slippers (a nice touch), a blanket and a pillow were provided, as well as noise-cancelling headphones and an amenity kit containing moisturiser, lip balm, a comb, eyemask, toothbrush and paste, ear plugs and three stickers saying “Please do not disturb”, “Please wake me for meal” and “Please wake me for duty-free”, which I thought was funny but quite handy. The choice of new international (UK/US) films was poor but there were also some classics and quite a lot of Vietnamese titles. If I had been on a day flight I would have been disappointed, though, as it’s a long journey (almost 12 hours) and these days you come to expect being able to catch up on lots of recent cinema releases. The best of the titles were Avengers: Age of Ultron, Focus, Horrible Bosses 2, Paddington, Interstellar, Jupiter Ascending, Taken 3, The Water Diviner, Wild Card and Paul Bart: Mall Cop 2. There is no way of getting rid of the Vietnamese subtitles (despite there being an option to do so, and films are “edited for content”, with swearing dubbed. There was the usual Dreamliner mood lighting, which crew were still getting the hang of (changing from white, to orange to purple to pale pink in quick succession at times), and large, electro-chromatic windows that tint at the touch of a button. Seats in row one are closest to the galley so may suffer some disturbance (you do get served first though). All 28 seats have direct aisle access, which is a real plus, but window seats feel the most private. Centre pairs aren’t too bad though. Row six is closest to economy. All seats have the same amount of legroom. After a bi-lingual safety video, the aircraft pushed back on time at 0130, and taxied to the runway in the storm, which appeared to be right overhead. After about ten minutes we took off, with lightning blazing away outside every few seconds. I have always been a fan of electro-chromatic tinted glass windows as you don’t need blinds to block out light, but after taking off in a thunder storm I found out why this can be a bad idea – sometimes you don’t want to see what is going on outside. It was a nerve-wracking take-off with red warning lights from the wings reflecting off the clouds and brilliant flashes of lightning all around, forking in the near distance once we got higher. It was also pretty bumpy. A reassuring announcement from the pilot would have been welcome. Once safely airborne at 1350, the cabin lights came back on and the dinner service began. Menus were handed around and drinks orders taken (I received mine with a bowl of nuts at 0225). I asked to use the in-seat power, which wasn’t working to begin with, and a member of crew turned it on (you can also charge devices through the USB socket). There was a choice of two starters (smoked salmon roll with avocado, or prawn with tuna sauce and mango salsa), and three mains, although nothing vegetarian, which was a shame. There was Hue beef noddle soup, Japanese-style grouper with steamed rice, and BBQ pork ribs with jacket potato. There was also a bread selection and two desserts (sweet potato cake and yoghurt cake). A section in the menu listed drinks but nothing under “champagne and wine”. I asked what the fizz was and she showed me a mini bottle of Heidsieck Monopole blue-top. I wasn’t hungry as had eaten in the airport, so I watched a film for about an hour before reclining the seat at 0330 and settling down for some rest. There was a fair bit of turbulence during the flight, which meant I woke up a few times but overall I slept well for 6.5 hours (with the help of a Nytol) until about 1000. The seat made for a comfy bed, but an under-sheet and cotton coverlet would have made it feel more luxurious. After freshening up, I watched the end of my film (the picture quality was very good) and waited for breakfast to be served at 1100. As well as cereal, pastries, yoghurt and fresh fruit, there was a choice of mains: hot Vietnamese beef noodle soup; ham, smoked beef and potato salad; and crepe with scrambled egg, Bechamel sauce, stir-fried mushrooms and gratin potato. I was pleased to see the last appeared to be vegetarian so I asked if it was and the stewardess nodded and wrote my request down. When she came back with it 20 minutes later, it had a sausage on it. I explained again that I was vegetarian and she apologised and said they had my pre-ordered special meal on board. 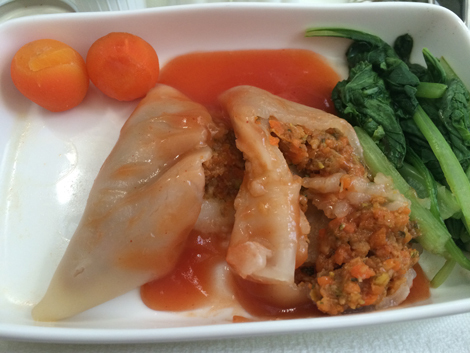 It wasn’t very appetising though – a pair of slimy triangles filled with minced vegetables and garnished with an artificial-looking red sauce. That said, the rest of the breakfast was nice. There was no wifi on board unlike on some other Dreamliners. I spent the rest of the flight working but found it a bit awkward to type as the tray table was too far away (this also made eating a little inconveniet). I asked a member of crew if it could be adjusted and she had a fiddle, then said no. 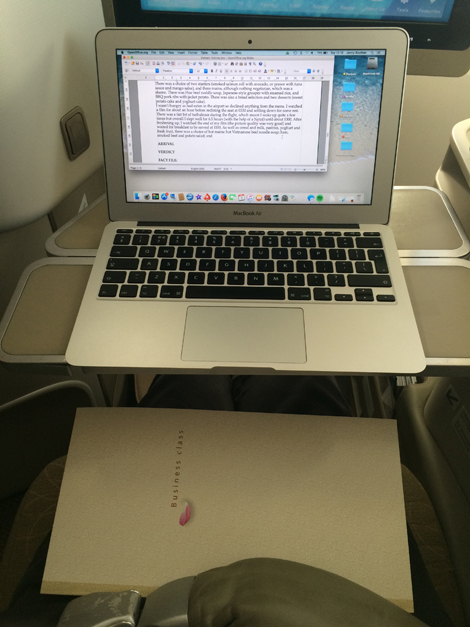 I also thought it was a shame it was so narrow – a good work surface is important in business class. The pilot came on at 1255 to announce our descent into London Heathrow, 45 minutes before landing, somewhere over Antwerp (according to the moving flight map). Headsets and menus were collected at 1305. We touched down on time, taxiing to the stand and then waiting as the airbridge was attached. Disembarkation was prompt, with premium passengers given priority. Immigration was very quick (I used to e-gates) and my baggage only took about ten minutes to appear. Vietnam Airlines has done well introducing the Dreamliner, which is a huge improvement to the B777 that I flew out on. 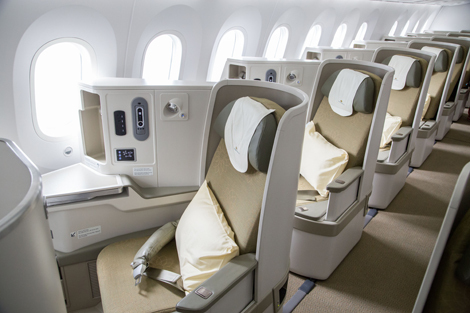 The business class cabin felt modern and airy. The onboard service could have been more informed and confident (the level of English is passable but not amazing), and the food needs to be better – as does the entertainment, which at the moment doesn’t do justice to the excellent technology. Apart from the tray table, the fully flat business class product is well designed – it feels private and all passengers have direct aisle access. Despite the storm, this was a good punctual service. PRICE Internet rates for a return business class flight from London to Hanoi ranged between 57,577,000 dong (£1,658) and 89,218,000 dong (£2,569) in October depending on flexibility.